Greetings. I'm here today to fry out your eyeballs with excessive amounts sprinkles and descriptive adjectives. Allow me to begin: these cupcakes are fluffy, moist, and luscious. They are bright and bold, joyful and jolly, exuberant and ebullient. They are decadent, delicate, delectable, delightful, delicious, desirable... deceitful... decapitating? Oh, and the frosting... it's so smooth and light. It's like a creamy, fluffy cloud of joy. I'm in love. And if that's not annoying enough, I took approximately a kadrillion and five pictures to prove it. Seriously, I am outta control, people. It's just... every picture I take is like a worn out outfit that I can't part with or another lipgloss in the arsenal. I might not be able to shut my closet door or snap my purse shut, but the hoard just keeps growing. Thus it is with my blog. The worst part is, my whole family just makes the problem worse for me. I mean, when I ask them to pick their favorite ones, they each have to pick about ten. BAM. Eighty pictures I can't leave out. They're all a bunch of enablers, I tell ya. And then there's Cookie calling from the other room, "Hey Yammie! I have the best picture for you to take!" So then I have to take even more. Seriously though, that was a pretty good one. But down to business. For the cupcakes I actually based it on a good old King Arthur Flour recipe. It's nice and easy, but still turns out springy and soft (watch out, here come the adjectives again). So first you just beat some butter into your dry ingredients till it looks like wet sand. Then add the eggs, one at a time. Then you add some yogurt and mix it till it's smooth. Don't forget to throw in a pile of sprinkles. Then while those bad boys are baking, we're going to whip up some German buttercream. Of course, we've already made our egg white based Italian buttercream and our egg yolk based French buttercream, but this is the first time I've made the custard based German buttercream. It's a lot easier than the other two I just mentioned since you don't have to worry about candy thermometers or anything crazy like that. I would say if you're bored of powdered sugar based frostings and you're ready to make the plunge into the world of cooked frostings, this is a great place to start. It's pretty simple and since it's custard based, it tastes just like homemade ice cream (a recipe for that coming soon, hopefully). We start by making a custard and letting it cool. Once it's completely cooled, you're going to beat in cold butter. But after ten minutes of beating, the magic will be complete. You can pipe it on if you think you're really cool. But obviously I got bored of that after five seconds. Just remember, this buttercream does have a different consistency than other frostings. It's closer to whipped cream. 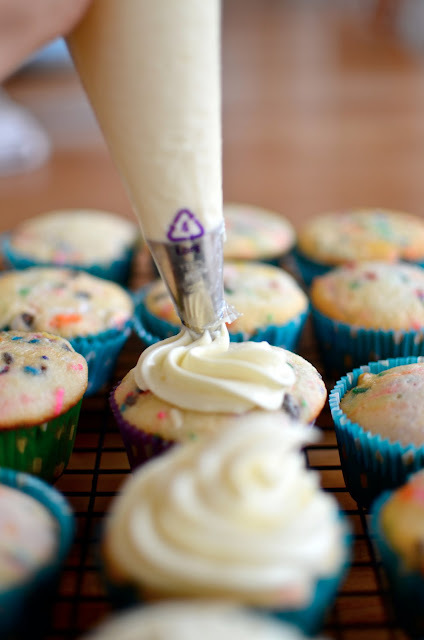 If you refrigerate the cupcakes, the frosting will be more firm. I'm a sucker for cold cake but the fam decreed that they were best at room temp, so it's up to you. Preheat oven to 350ºF. Line muffin tins with cupcake liners. Combine the flour, sugr, baking powder and salt. Beat in the butter until the mixture is the consistency of wet sand. Beat in one egg white at a time, beating well after each addition. Mix the yogurt and the extracts and add about 1/3 at a time, beating a couple minutes after each addition. Very gently fold in the sprinkles. Do not overmix or the colors will run. Divide into tins and bake about 18-20 minutes or until a toothpick comes out clean. Bring the milk and vanilla to a simmer. 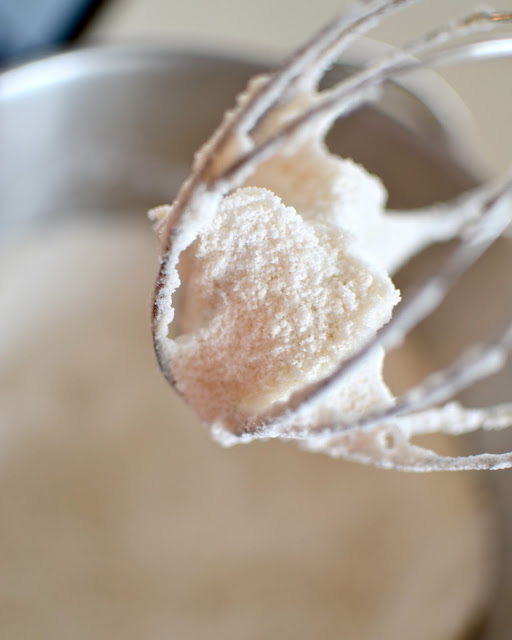 Meanwhile, mix together the sugar, egg, yolks, and cornstarch in a separate bowl. Once the milk is simmering, add about 1/3 of it into the egg mixture, whisking constantly. Then add it all back into the remaining milk. 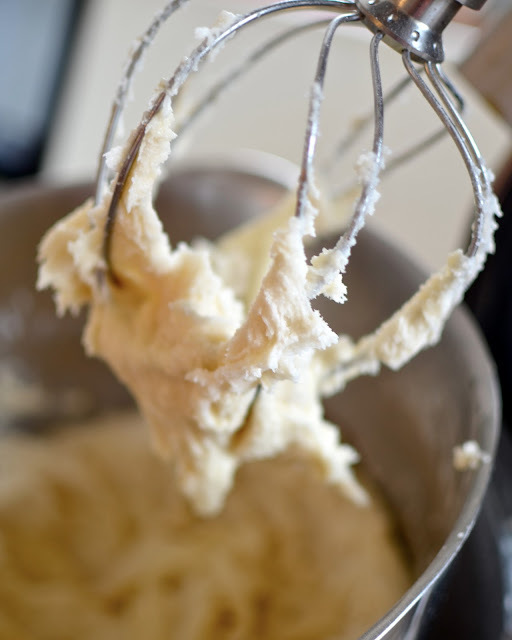 Whisk over medium heat until it begins to bubble and thicken. Remove from heat. Cover with plastic wrap (letting the plastic touch the top of the custard) to prevent a film forming on top. Cool to room temperature (I was impatient and put it in the freezer). Once it's completely cool, add the butter a small handful at a time, beating well after each addition. Continue beating for about ten minutes or until smooth. 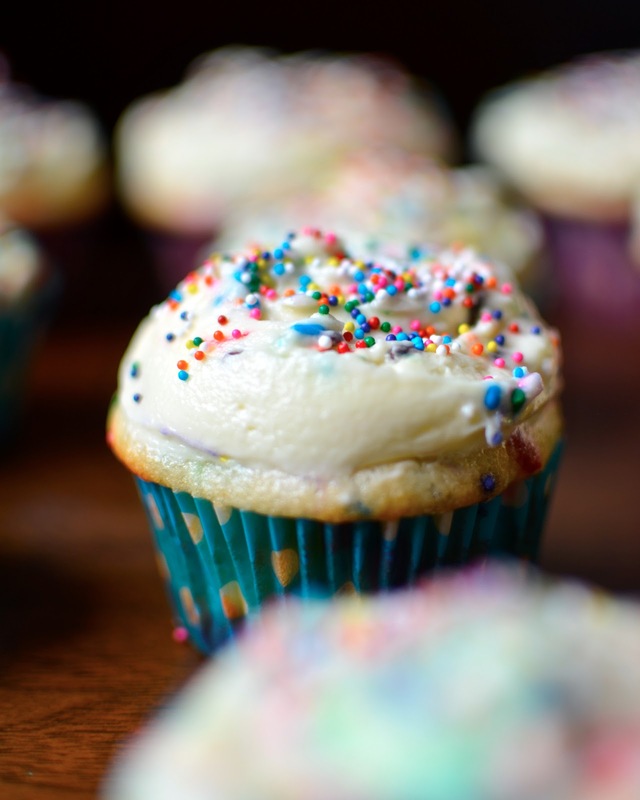 Frosted cupcakes may be refrigerated for a firming frosting or let at room temp for a more whipped cream like consistency. Don't forget to follow on Facebook!